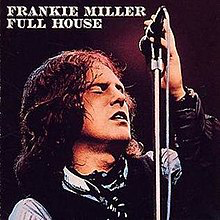 Frankie Miller always had the approval of the cognoscenti, but commercially he never quite made it, whereas similar gravel-voiced bluesers like Rod Stewart, Paul Rodgers, and, to a lesser extent, Dan McCafferty did. Maybe his material just lacked that certain bit of something extra to raise the bar. Certainly he had the voice. This album, from 1977, is ok. It somehow sounds just a tiny bit "ordinary" in places, however, particularly at the beginning. Perfectly enjoyable to listen to, of course, but nothing initially to make you sit up and think "wow". The opener is quite well known - "Be Good To Yourself", written by Free's Andy Fraser, is a rousing rocker with some wonderful riffs and a singalong refrain. "The Doodle Song" is a bit throwaway and lightweight, however, as is the mournful ballad "Searching". Miller's cover of John Lennon's "Jealous Guy" is excellent, though, big, strong, soulful and solid. Similarly his Free-esque upbeat piano and bass-driven blues rock-ish cover of "Love Letters". These two still sound pretty convincing. "Take Good Care Of Yourself" is a superb, big production ballsy and majestic rock/blues ballad. It is full of punchy brass backing and Miller's vocal is at its finest. "Down The Honkytonk" is a copper-bottomed slice of pulsating rock, the most exhilarating on the album. This old "side two" is better than "side one", to be fair. Much better. I remember seeing Miller live in 1978 and this was the stuff he played. It sounded great live, probably better than on record. He did seem to be one of those artists that everyone enjoyed seeing live, but he didn't shift as many records as he should have done. Like John Mayall, Carol Grimes, Maggie Bell and Eddie & The Hot Rods. They all put on a good, honest show. "This Love Of Mine" is a powerful, brass-driven ballad in the Southside Johnny style with echoes of Otis Redding too. "Let The Candle Light Shine" is a US-sounding mid-tempo rock number with yet another great vocal and some killer guitar too. The horns kick in again on the lively country/blues rock of "(I'll Never) Live In Vain". (Why did they use those brackets so arbitrarily?). To give this album its due it has a great "side two", which raises its overall quality considerably.